Who is da Gales Last Man Standing 2018. Rules: Pick one team from each round. If your team wins in round 1, then you continue to round 2 and so on. If your team loses or draws, you’re out of the competition. Southern Gaels do it again! Second year in a row to win a prize in the St. Patrick's Day Parade - Best Sports Group! Thanks to the Westmeath Camogie players, the Ardnagrath players and Drumraney for making it a great day for all! However, the greatest thanks goes to the parents of the kids that brought them along on what was a shkinnin' day! Go raibh míle maith agaibh! Gaels Abú! We even got national coverage on the Six One News and the Nine o'clock news!! Some club! All Hurling is good hurling, especially when you’re underage. When an option of Volley Hurling is thrown out, one wonders is it worth nearly an hour’s drive each way for some indoor hurling when we normally don’t do any indoor hurling for this age group. But when you take the bull by the horns and engage in the game, you can either love it or hate it. However, it was the Love of the Game that shone through for all our maturing hurlers. It can be a big turning point for any hurler as they reach the large expanse of full field hurling at U14, but definitely these novel games makes that step so much easier with allot of craic on the way. Our lads were slow to start this volley process but definitely matured into it and learned how to read a game and see what tactics needed to be applied and then tried to implement them. There were 3 Volley Hurling days, with 6 games over the first 2 days followed by a much longer last day match up. So, it’s with pride that all our hurlers can look back at this tournament and be very very happy on how they engaged in the process and led on to learn allot on what it takes to architect the perfect volley hurling goal, of which there were many. We had 11 hurlers who got the privilege of Hurling for Volley Goals up against Delvin, Clonkill & Castletown Geoghegan, in Clonkill’s indoor hurling hall. The Hurlers who earned the Westmeath Shield Volley Hurling Trophy are Páidí Ó Leochain, Michael Dolan, Paul Hogan, Ryan Fallon, Calum Devaney, Luke O'Connell, Cian Geary, Cillian Geary, Cormac Bradley, Thomas Collins & Dano McMonagle. You did Southern Gaels proud, and set us off to a great start with a trophy in the bag before the end of February. What a start to SG18, blazing a trail for the rest of the teams. Gaels Abú. 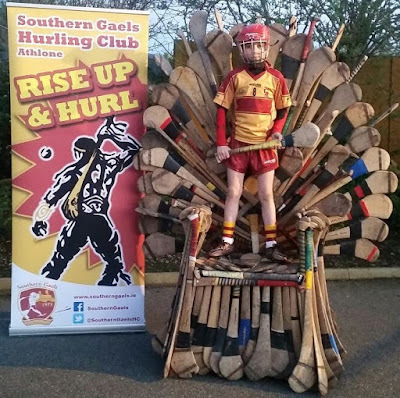 Want to give Hurling a go? Not sure what to do ? No problem, just come along on one of our training days that suits you. Experienced coaches, spare helmets/hurls always available in a fun/safe environment. Just come along and try it out and see how you get on. No obligation/membership fees needed, just come along and approach one of our friendly mentors and they will point you in right direction! Marist School Hall, Retreat Road, Athlone. Athlone Regional Sports Centre Astro. The great and the good of Southern Gaels will gather in Áras Chiaráin on Friday 20th October to celebrate what has been a busy but successful year for this busy and successful hurling club. The current plan for the night is for the club’s Intermediate team to take on a selection of SG legends and current “Rise Up and Hurl” Tuesday night hurlers to compete for the John Maher Cup at 8pm. After this, players will join parents and club personnel in the clubhouse for the presentation of the Bill Stacy Hall of Fame award at 10pm where a past member will be honoured for their work with the club. After this there will be various other awards for player of the year and club person of the year. Following on from this finger food will be served along with appropriate beverages for a night of hurling recollections and dreams for the future. Be sure to book the babysitter for what promises to be a great night. It is hoped, in particular, that parents of the juvenile squads will join us for a well—earned drink or two after a summer spent travelling the highways and byways of Westmeath and environs in the promotion of the great game of hurling! Friday November 24th, 2017 at 9.00 PM in Pairc Chiarain. Our U14 squad and management continue with their preparations for Féile which takes place on 16-17 June. This is the first time since 2003 that the club will be represented at this national competition, when they will be hosted by the Clara club in Kilkenny. Their first two games are in Borris, Carlow where they will play Mount Leinster Rangers (Carlow) and Tooren (Mayo) on Friday 16 June. On Saturday 17 June they will play the host club in Clara before travelling to New Ross in Wexford for their next game, with opponents to be confirmed yet. To offset against the significant cost of Feile, the management are looking for sponsors for a Féile souvenir programme that is being published to mark the club's appearance in Féile. The programme will be a fine publication carrying profiles of all players, photographs, articles and club/Féile information. If any individual or business would like to take an advert in the programme please contact Martin (087-2253350), Tommy (087-6523333) or Cormac (087-2353089). 4.00+: Clubhouse open to watch Club Finals. Friday September 16th was bowling night for Southern Gaels and a great turnout ensured that everyone had a super time. The Bowling Alley was awash with Southern Gaels jerseys from 7.00 on with most of our younger bowlers coming straight from training. Their shooting and skill levels were excellent and some impressive scores were put on the boards. It was a pleasure to see so many of our players from all age groups playing and working together. The parents came in numbers too encouraging their offspring and helping with the chips, onion rings and sausages - such dedication is what makes this club the best! The much anticipated draw for the Joe Canning-signed hurleys was held at nine o'clock and the worthy winners were Oisín Flynn, Tom O'Keeffe and Cormac Bradley, Lorcan Farrell - nice that the four hurls went to three of our age groups. Once the dust settled on the juvenile event some serious swinging started as the adult teams took to the alleys. Up to 13 teams lined out for the competitive shoot-out but only one team could win on the night and that honour fell to Declan Finn, Martin Geary, Dermot Whelan and Gearóid Ó Duibhir who were the only team to break 400! A big thank you again to Planet for hosting the event and our great sponsors: Wines Direct, Sásta, Club Viva and Planet Athlone. The club draws for May, June, July and August were held to end the night and as it happened many of the winners were present which added to the high spirits all round. Thanks to all who turned up, took part, tasted the goodies and tried their best! Well done to the organisers and we're looking forward to the event next year already. Oh and well done to Bridie Gately (c/o Maeve Gately) who won the All-Ireland football tickets. Gaels Abú! Scheme runs during April and May 2016. First Prize: A1 Cabs: Name/Logo on Southern Gaels Adult Team Jerseys for Two years. Second Prize: Anne Egan Farrell: Pitch-side Advertisement Sign in Páirc Chiaráin for Two years. Third Prize: Spollens Supermarket: Pitch-side Advertisement Sign in Páirc Chiaráin, for 2 years. Fourth Prize: Padraig Egan Buses: Pitch-side Advertisement Sign in Páirc Chiaráin, for Two years. A sincere Thanks to all Ticket Purchasers. Your sponsorship of our hurling club is greatly appreciated.